Sister Marie Joseph Kerr, O.S.F. 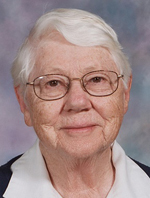 Sister Marie Joseph Kerr, O.S.F., 87, died Feb. 7 in Assisi House, Aston. She had been a professed member of the Sisters of St. Francis of Philadelphia for 66 years. Sister Marie Joseph was born Catherine Mary Kerr in Trenton, N.J., where she was a member of Blessed Sacrament Parish and a graduate of St. Mary Cathedral School. She entered the congregation in 1947 and professed her first vows in 1951. She earned a B.S.N. in nursing education from The Catholic University of America and her M.A. in nursing from Penn State University. She ministered primarily in nursing and nursing instruction/supervision. Sister Marie Joseph ministered for 33 years in the Archdiocese of Philadelphia, 11 of those years at St. Agnes Hospital — first as nursing supervisor and later as a clinical instructor. She also worked in nursing at St. Mary Children’s Health Center in Bensalem and as a clinical instructor at Neumann University. In later years she worked as a volunteer at Clare House in Aston, Anna’s Place in Chester, and Catholic Workers Free Care Clinic in Philadelphia. In 2009, she moved to Assisi House where she served in prayer ministry until her death. Sister Marie Joseph spent 13 years in Zambia, Africa, where she ministered to the sick at Fatima Catholic Mission in Zambia and Meheba Refugee Center in Solwezi. She loved being a nurse and cherished her time among the Zambian people. She also ministered for four years in the Diocese of Trenton providing health care to migrants, nursing at Martin House and St. Francis Medical Center, and volunteering at Mount Carmel Guild. Additional ministry includes St. Joseph Hospital in Lancaster; St. Patrick Hospital in County Cork, Ireland; and St. Joseph Hospital in Baltimore. The funeral Mass was celebrated Feb. 14 in Assisi House, 600 Red Hill Road, Aston, and burial followed in Our Lady of Angels Cemetery in Aston. Sister Marie Joseph is survived by her nieces, nephews, and by her Franciscan family.